There are four on-site hotels at Foxwoods Resort Casino in Mashantucket, Connecticut. Two, the Grand Pequot Tower and the Great Cedar Hotel, are attached to the original casino. Foxwoods' newest hotel, the Fox Tower, opened in 2008. Two Trees Inn is located on the opposite side of Route 2, and regular shuttles ferry guests between the inn and the rest of the casino resort. This Foxwoods property map shows the locations of the four hotel options. Reservations for all four Foxwoods hotels may be made online or by calling toll free: 1 800-369-9663. Opened originally as part of the MGM Grand at Foxwoods and renamed the Fox Tower in 2014 when Foxwoods' deal with MGM came to an end, this 825-room hotel—the largest on site—has a hip vibe and offers access to the newest gaming and entertainment attractions at the casino resort including the Tanger Outlets at Foxwoods. It is connected to the main property by a moving walkway, so you never have to go outside once you arrive. With a gorgeous outdoor pool, the G Spa, room service dining from 6 a.m. until 11 p.m. daily, a business center and complimentary valet parking, it's the favorite hotel at Foxwoods. 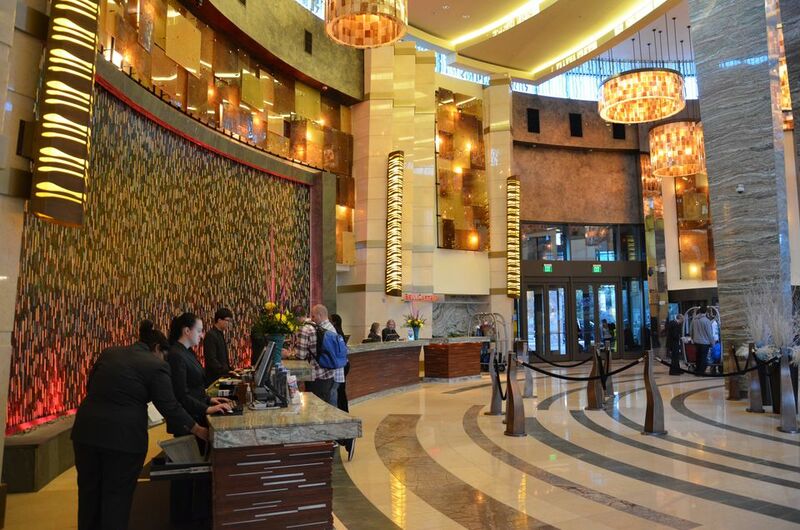 Foxwoods' 23-story Grand Pequot Tower Hotel has 306 guest rooms and suites and offers room service dining from 6 a.m. until 11 p.m. each day. The hotel also features a business center, meeting and conference facilities and the Norwich Spa at Foxwoods with an indoor pool. Complimentary valet parking is included with your stay. The Grand Pequot Tower is also home to The Villas at Foxwoods: 23 spacious and uber-luxurious suites with pampering amenities including Jacuzzi tubs, large-screen TVs and 'round-the-clock butler service. The Great Cedar Hotel in the heart of the original casino has 317 guest rooms and suites, room service daily between the hours of 6 a.m. and 11 p.m., an indoor pool and exercise facility and meeting and conference facilities. Two Trees Inn offers Foxwoods guests a heated indoor pool and fitness room, complimentary morning coffee in the lobby and a 24-hour courtesy casino shuttle. The 280-room inn has its own restaurant and sports bar: Two Trees Tavern. Two Trees is the most family-friendly of the hotels at Foxwoods. You might even choose to stay there with your family when your primary desire is to spend days at Rhode Island's beaches... not the casino. Pet-friendly rooms are available. Combine your gaming getaway with the pampering and relaxation of a spa. The Spa at Norwich Inn in Norwich, Connecticut, is about 15 minutes from Foxwoods and is owned by the Mashantucket Pequot tribe, which also owns the casino. Located 15 minutes from Foxwoods and within walking distance of Mystic, Connecticut, attractions, the Mystic Hilton is a full-service hotel with 182 rooms. Amenities include an indoor swimming pool, fitness center, restaurant, lounge and more. Whirlpool rooms are available, and all rooms have access to high-speed Internet and room service. This deluxe, 285-room property is conveniently located just off I-95 about 20 minutes from Foxwoods. The hotel's Elizabeth Arden Red Door Spa and indoor pool, whirlpool and fitness center are added bonuses. One of the closest hotels to Foxwoods, the Bellissimo Grande offers an indoor heated pool, a spa, room service and other upscale amenities. This 139-room hotel is located just three miles from Foxwoods in North Stonington, Connecticut. Your room rate includes free scheduled shuttle service to Foxwoods Resort Casino. Other amenities include free WiFi, free deluxe continental breakfast and free HBO. Motorcoach tour groups can be accommodated. This Holiday Inn hotel a short drive from Foxwoods features a fitness center and indoor pool, an on-site restaurant and free wireless Internet access. This conveniently located Econo Lodge is a pet-friendly hotel with some of the cheapest overnight rates you'll find near Foxwoods. Situated just 7 miles from Foxwoods, La Quinta offers value to casino-goers with rates that are typically under $100 and expansive amenities including an indoor pool, fitness center, free WiFi and free Bright Side Breakfast. This dog-friendly Waterford, Connecticut, motel with an outdoor pool offers affordable rates and free continental breakfast. Located in Ledyard less than one-third of a mile from Foxwoods, this modern B&B has six rooms, some with fireplace or Jacuzzi, and also a pet-friendly cottage available. Located about 15 minutes from Foxwoods on the Mystic River in Mystic, Connecticut, this cute, intimate B&B is ideal for boat lovers, with several rooms and suites at "dock level." The Fitch Claremont Vineyard B&B in Bozrah, Connecticut, is more than just a country bed & breakfast inn... it's an award-winning winery! All rooms include a complimentary bottle of wine. This B&B in Preston, Connecticut, offers unique accommodations in three guest rooms with private baths and wood-burning fireplaces. Your stay includes a three-course breakfast, coffee and tea bar, baked goods with lemonade or cider in the afternoon, wine in the evening and free WiFi. You may feel lucky enough you won't want to leave to take your chances at Foxwoods. This Scottish B&B in a restored, 250-year-old Victorian farmhouse is located 1.3 miles from downtown Mystic, Connecticut—about 15 minutes from Foxwoods casino. This Ledyard, Connecticut, bed & breakfast near Foxwoods has four rooms with private baths and cozy fireplaces and serves a full homemade breakfast. Stay in this sunny 1807 Georgian Colonial turned B&B in Ledyard, Connecticut. It's on the National Register of Historic Places and very close to Foxwoods Casino. Mohegan Sun is More Than a Casino!